Save yourself some time and money, don’t follow the fads thrown at you on TV. Common sense will tell you that by just doing a few simple things, you can have the health you want. Want to know what the next great health kick is? It has been around for a long time and the results are long term benefits. The Next Big Health Kick is not something that you have to pay a lot of money for, but if you don’t do it, you will end up paying a lot of money for prescriptions, doctor visits, and maybe even a shorter life. Here it is, Eat Healthy. What, that’s it? Yes, if you stop and think about it, what are we eating? What is going in our bodies that promotes obesity, high blood pressure, diabetes, and a shorter lifespan? It boils down to eating too much of salt, sugar and fat. But, you say, I can’t avoid it because these ingredients are in just about everything that we eat that is processed. That is the key, slow down on the processed foods. They are loaded with these three ingredients and society as a whole is devouring these ingredients at a faster rate than ever. You do not have to go cold turkey and stop consuming all salt, sugar, and fat. Try substitution. Next time you are really hungry for a snack, substitute the potatoes chips with a piece of fruit or a vegetable that has not been fried. Take this in baby steps. Let your body adjust to food that is healthy and find out the great taste of fresh food. Food that hasn’t been manufactured to stay on the shelf for extended periods. Think about it, if the food you eat does not spoil, then it is not natural or healthy. When you cut back on salt, you will improve your blood pressure, you will lose weight from having less water retention. When you lose weight and your blood pressure is lower, you feel better, sleep better, and will be on your way to a healthier life. When you cut back on sugar, you will have the same thing happen: lose weight, lower blood pressure, sleep better and feel healthier. When fat is cut back, the fat that you have will start to melt away. You lose weight, lower blood pressure, sleep better and feel healthier. This may all sound simple and it may sound too hard to do, especially after the holidays and all the temptations of food with an excess of these ingredients. This I will promise you, if you take small steps and stay on track with eating healthy, you will feel better. Maybe not at first, because your body has to get rid of some of the toxins that have been ingested, but you will start to feel better. The other thing I can promise is that if you continue to eat unhealthy, it will catch up to you and you will have to deal with the illnesses that plague society now. Live life healthy, the price is too high not to. In the future I will take a look at the new guidelines that have been established by the USDA for our health and nutrition. I have read through them and I can summarize what they say is what I have just stated in this article. They have given recommendations to reduce our salt consumption to 2300mg or less and to make our added sugar and fat consumption no more than 10% in our diet. They also state to make this a long term lifestyle change and to do it in small steps. I think they have been reading this magazine! As you can see we have a lot to talk about and to work on to stay healthy. This is the new health kick! The price is paid by the choices you make. Take baby steps, don’t try an overnight transformation. I am not saying that progress can’t be made overnight, but this is a lifestyle change, not another fad that that will cost you tons of money. Think about it, how many pieces of exercise equipment have you seen donated? Small changes yield big results. “Chapter 2 Shifts Needed To Align With Healthy Eating Patterns.” Current Eating Patterns in the United States. N.p., n.d. Web. 09 Jan. 2016. 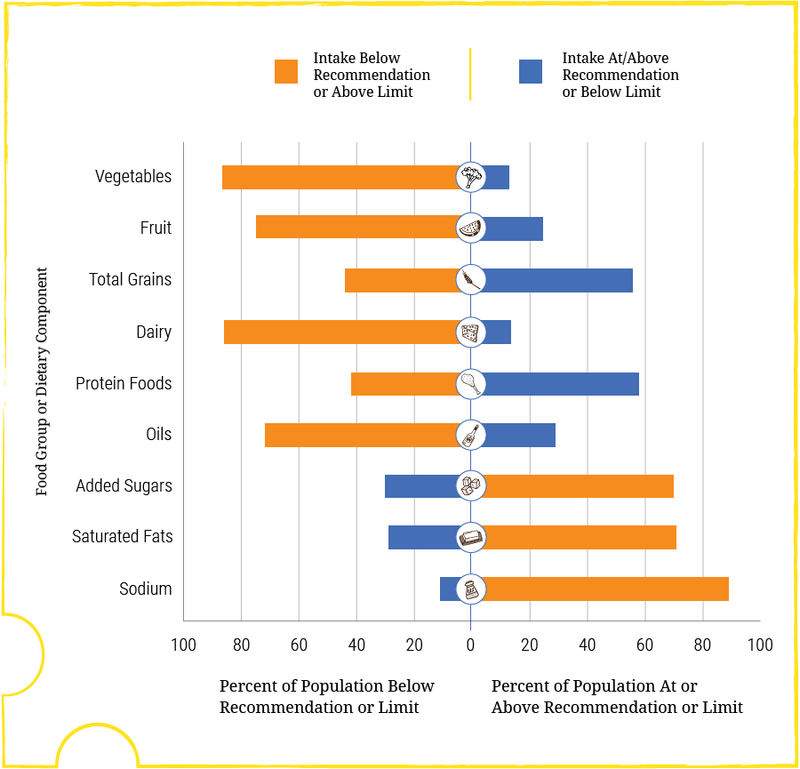 “Chapter 2 Shifts Needed To Align With Healthy Eating Patterns.” A Closer Look at Current Intakes and Recommended Shifts. N.p., n.d. Web. 09 Jan. 2016.